It is important to note that it is usually not wise to choose mutual funds solely on their past performance, but rather by looking at their holdings and how much they charge in expenses to hold those funds. If two funds hold identical stock portfolios, it makes no sense to pay one fund manager $10,000/year and another $1,000/year to manage the same $1,000,000 investment in the same stock portfolios. The cheapest MPF stock (equity) funds charge around 0.8% per year, compared with 2800.HK charging 0.1% per year for HK stock exposure, and 3101.HK, 3140.HK and 3126.HK charging 0.18% per year for international stock exposure. Guaranteed and Mixed Asset funds are basically expensive blends of stock and bond funds. MPF money market funds can be some of the cheapest, charging as little as 0.35%, but an average of 0.6%, which is more than most banks pay on fixed deposits. 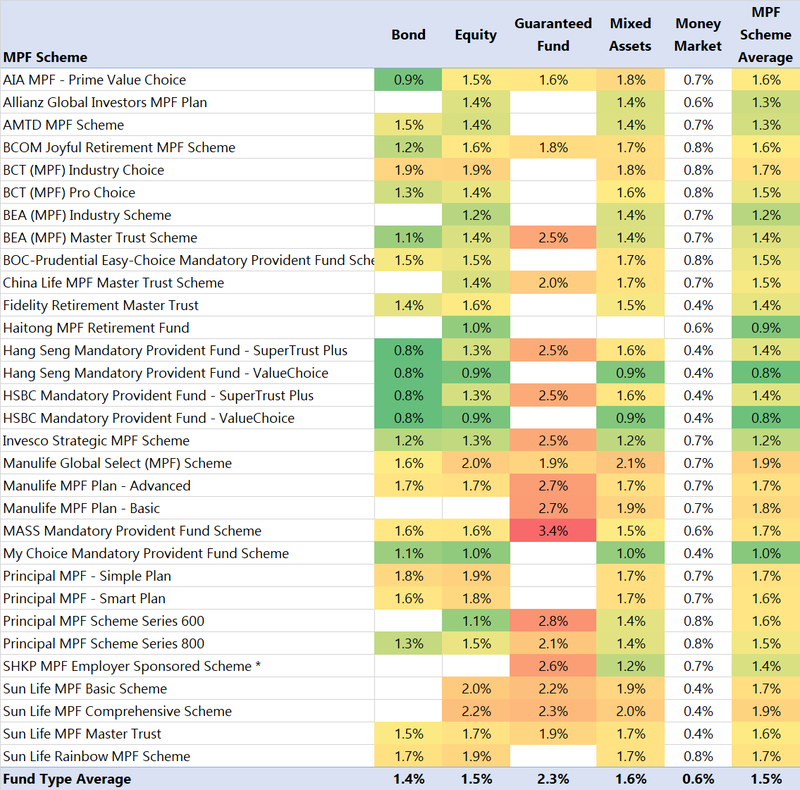 Money market funds are rarely a good place to allocate much of an MPF account anyway. The higher cost of MPF schemes is supposedly due to all the manual and paper-based administration of MPF accounts for employees, which is why it would be so important for the MPFA to push paperless, electronic administration and direct ETF-based MPF plans invested in low-cost ETFs through CCASS. Another comparison is that most MPF plans charge fees comparable to full-service financial advisers, but without the service. MPF is the mandatory retirement fund that all non-exempt Hong Kong employers and employees are required to contribute to, and so far, the only people I’ve met who seem happy with any of the MPF schemes are those who make large fees managing or selling them. Meanwhile, when asked, I often recommend employees put in only the mandatory MPF contributions and make no voluntary contributions, as there are better and cheaper investment options outside of even the best MPF schemes. This post of course is not investment advice and not a recommendation to buy or sell any investment product.